WHAT DID YOU WANT TO BE WHEN YOU WERE YOUNGER AND WHY? When I was about 12-13 years old, I wanted to be an accountant. I preferred maths to English and science because I liked calculations and solving problems; but there might have been a family influence, too. 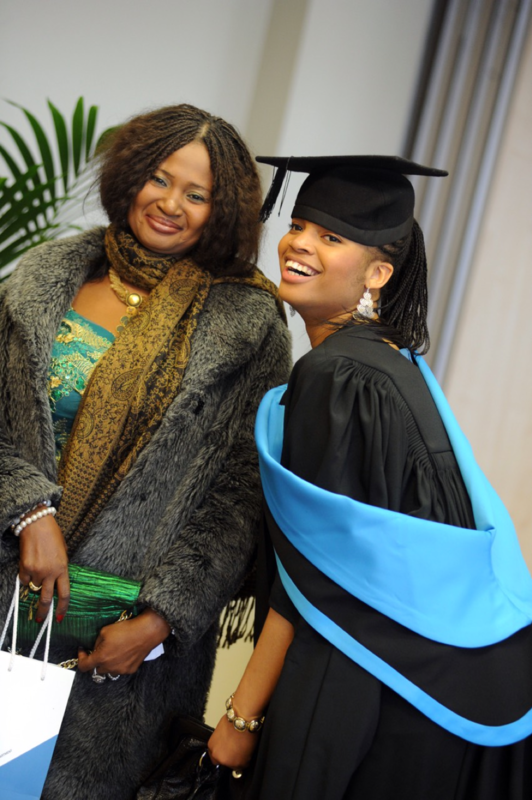 My family is very maths- orientated and I wanted to be a business woman like my mum. She runs her own courier business in Nigeria, and I was fascinated by how she managed family life alongside her business interests. SO, YOUR MUM WAS A STRONG ROLE MODEL FOR YOU, THEN. Yes! I saw that she enjoyed her work and I sought to help her in many ways, including exchanging sums of money with customers and calculating profits. Given the difficult environment of doing business in Nigeria (poor infrastructure is one example), she had to find ways to overcome many challenges. I remember her always having a plan B – and C! YOU GOT A C FOR ECONOMICS, AND A B FOR BOTH BUSINESS STUDIES AND MATHS. 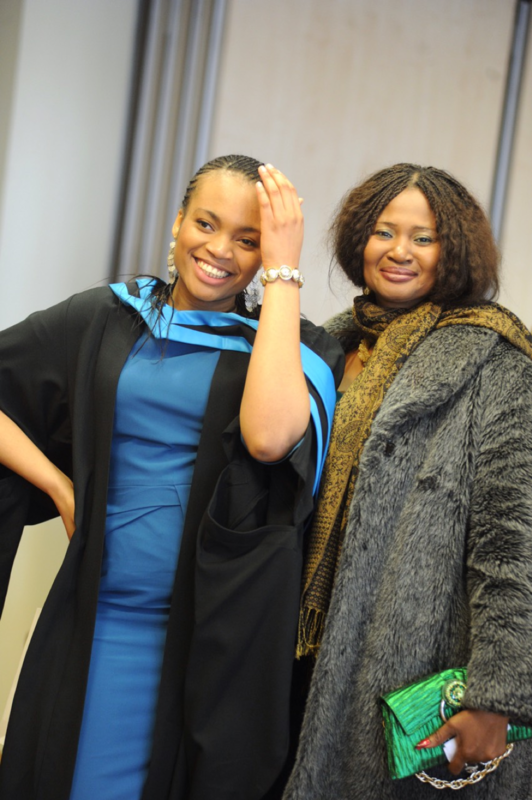 WHY DID YOU CHOOSE TO STUDY ECONOMICS AND NOT BUSINESS STUDIES OR MATHS AT UNIVERSITY? 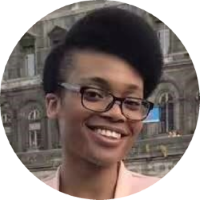 I actually started doing a business economics degree, but half way through the course – in my second year – I realised I was enjoying the economics modules more than the business modules. And my economics grades were better, too. So, I changed my degree to economics. WHY DID YOU CHOOSE THE UNIVERSITY OF MANCHESTER? I wanted to go to a university that was rated the best for economics. But I didn’t just go for the top five universities in the UK; I targeted the top 20. Manchester was in the top 20 at the time. Lots of my friends went there, but I was also drawn to its student lifestyle, performance ratings, its Economics Society and its Trade & Investment Society. AFTER YOUR MASTER’S DEGREE AT THE UNIVERSITY OF WARWICK, YOU WORKED IN LONDON FOR TWO YEARS. WHY DID YOU CHOOSE TO GO BACK AND STUDY FOR A PHD AT THE UNIVERSITY OF GLASGOW? I wanted to carry on working on my master’s thesis in sovereign debt, and I eventually chose the University of Glasgow because of the resources it provides. The economics department holds weekly workshops with external speakers, which allowed me to network with people from within the University of Glasgow and externally. It also hosts conferences, and I was fortunate to co-organise some of those with the help of my supervisors. Not only that, but Professor Sayantan Ghosal, who was my supervisor at the University of Warwick, had moved to the University of Glasgow and was interested in furthering my master’s thesis. When another professor accepted my request for supervision, it was a no brainer. YOUR RESEARCH IS IN SOVEREIGN DEBT IN EMERGING ECONOMIES. WHAT DO YOU HOPE TO ACHIEVE WITH THIS RESEARCH? Much of the debt owed by developing countries is in a foreign currency. So, it’s very difficult for these countries to manage their debts. I’m really interested in understanding how they might address certain debt problems, and the types of debt management policies they could adopt. 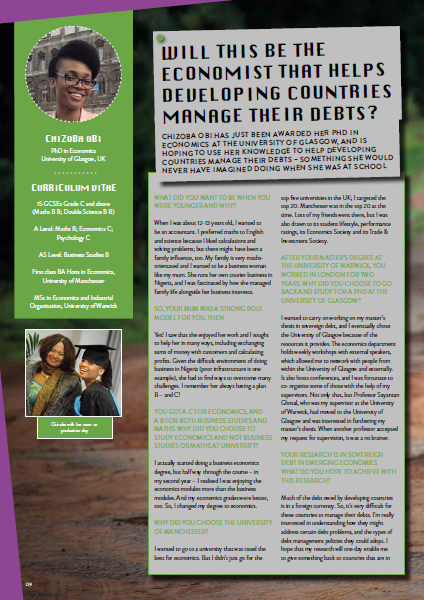 I hope that my research will one day enable me to give something back to countries that are in debt distress – African states, in particular. At the moment, I’m focused on gaining experience and applying my knowledge at the Scottish Fiscal Commission, where I currently work, so that I can achieve this end goal – giving something back to my continent. IT’S INCREDIBLY INSPIRING TO SEE HOW FAR YOU’VE COME CONSIDERING YOU DIDN’T GET AN A OR A* IN MATHS. WHAT ADVICE DO YOU HAVE FOR YOUNG PEOPLE WHO MIGHT BE STRUGGLING WITH THEIR STUDIES? Thanks for sharing your inspiring story. I believe that those in High school, college and even those in later phases of their lives can be motivated from your personal experience. Congrats! Congratulations! This is a proof that perserverance breeds success.